"Some pig." Those words famously spared the life of Wilbur in the children's classic Charlotte's Web. For Palm Beach resident Jolene Shapiro, Jason is some pig. 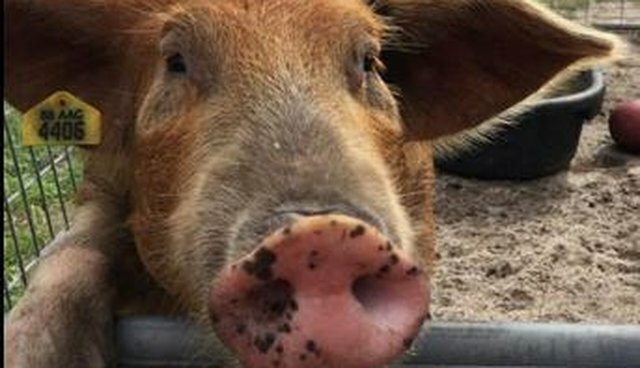 He was one of hundreds of pigs rescued from a cruelty case who ended up at Palm Beach County Animal Care and Control. All of the pigs except Jason carried contagious diseases and sadly were euthanized. Shapiro has visited Jason on a daily basis since fall 2015. Jason has become very special to Shapiro, showing her how unique, intelligent and social these creatures truly are. Like Jason, all pigs are smart, sensitive animals. Too many of them are abused on factory farms. Most pigs in the pork industry are deprived of feeling the grass beneath their feet and the sun on their back. Most never breathe fresh air until they're loaded onto a truck bound for slaughter. And breeding pigs are locked in tiny cages so small they can't even turn around. This cruel confinement is beginning to change as more and more people learn about pigs and want to ensure they receive better treatment. Pigs are actually among the cleanest animals. In fact, MSNBC writes, "They are perhaps the smartest, cleanest domestic animals known - more so than cats and dogs, according to some experts. But pigs don't have sweat glands, so they roll around in the mud to stay cool." And they're intelligent, too. In fact, while chimpanzees are known for their smarts, pigs might be just as intelligent. Pigs are able to solve problems that require they understand relationships and rules. For example, researchers trained them to move a cursor with their snouts. Then they were tasked with using the cursor to differentiate scribbles they were familiar with from others they were just seeing for the first time. Pigs learned how to make the distinction just as quickly as chimpanzees, our closest living relatives. Pigs also have distinct preferences. As Shapiro found out on her regular visits, Jason is a very discerning pig. Recognizing his loyal visitor (and bearer of food) when he sees Shapiro coming to his enclosure, he gets as excited as one would expect a dog to be when his person comes home, running back and forth alongside the fence and greeting her with enthusiastic grunts. While most pigs lives' are a stark contrast from Jason's happy one, fortunately, there's a movement transforming the pork industry. Organizations like The Humane Society of the United Sates persuade some of the world's largest food companies to eliminate cruel gestation crates that confine breeding pigs. The HSUS also works with state legislators to ban cruel confinement practices, with Florida leading the way in 2002. In addition, people are increasingly practicing the "Three Rs" of eating: "reducing" or "replacing" consumption of animal products and "refining" our diets by switching to products from sources that adhere to higher animal welfare standards. Like Wilbur and Jason, all pigs are intelligent, feeling creatures deserving of our kindness. For too long, the pork industry has subjected these amazing animals to mistreatment that no person would say is humane. One easy way we can all help is to consider the impact of our food choices and take steps to improve the lives of pigs and other animals. I'm certain Jason would approve. Kristie Middleton is the Senior Director of Food Policy for The Humane Society of the United States.